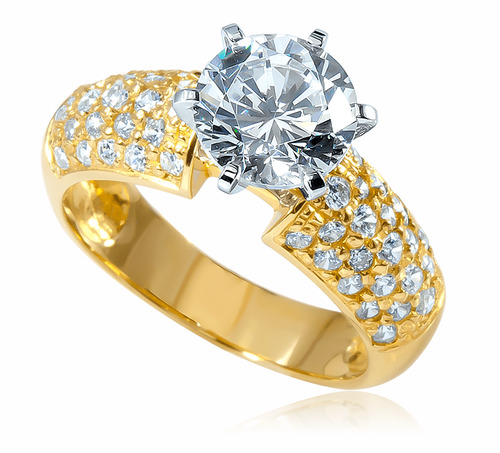 Our Pave Splendor 1.5 Carat Round Wide Pave Cubic Zirconia Solitaire in 14K Yellow Gold features a 7.5mm round brilliant center set in a six prong die struck head with pave set round cubic zirconia and includes an approximate total carat weight of 2.5 carats. 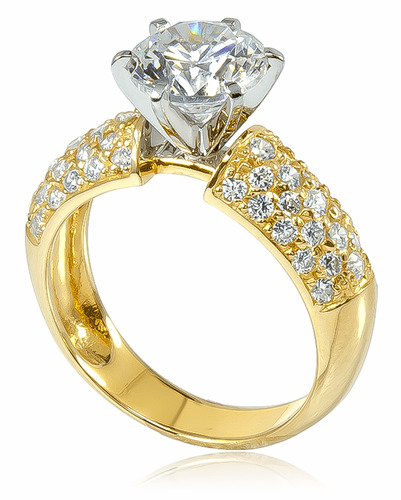 The solitaire is encrusted with pave set round cubic zirconia half way down both sides of the shank. Our lab created laboratory grown Russian formula cubic zirconia are hand cut and hand polished to exact diamond specifications. 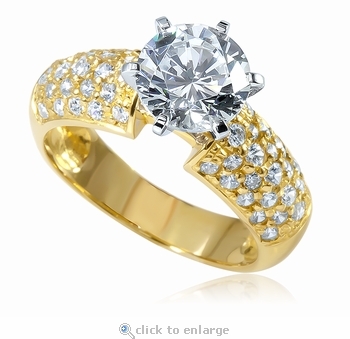 The solitaire engagement ring measures approximately 7mm at its widest point. For further assistance, please call us directly at 1-866-942-6663 or visit us via live chat and speak with a knowledgeable representative.